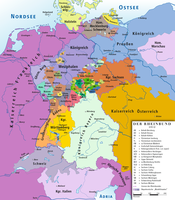 The Kingdom of Saxony (German: Königreich Sachsen), lasting between 1806 and 1918, was an independent member of a number of historical confederacies in Napoleonic through post-Napoleonic Germany. The kingdom was formed from the Electorate of Saxony. From 1871 it was part of the German Empire. It became a Free state in the era of Weimar Republic in 1918 after the end of World War I and the abdication of King Frederick Augustus III of Saxony. Its capital was the city of Dresden, and its modern successor state is the Free State of Saxony. Before 1806, Saxony was part of the Holy Roman Empire, a thousand-year-old entity that had become highly decentralised over the centuries. The rulers of the Electorate of Saxony of the House of Wettin had held the title of elector for several centuries. When the Holy Roman Empire was dissolved in August 1806 following the defeat of Emperor Francis II by Napoleon at the Battle of Austerlitz, the electorate was raised to the status of an independent kingdom with the support of the First French Empire, then the dominant power in Central Europe. The last elector of Saxony became King Frederick Augustus I. Following the defeat of Saxony's ally Prussia at the Battle of Jena in 1806, Saxony joined the Confederation of the Rhine, and remained within the Confederation until its dissolution in 1813 with Napoleon's defeat at the Battle of Leipzig. Following the battle, in which Saxony — virtually alone of all the German states — had fought alongside the French. King Frederick Augustus I was deserted by his troops, taken prisoner by the Prussians and considered to have forfeited his throne by the allies, who put Saxony under Prussian occupation and administration. This was probably more due to the Prussian desire to annex Saxony than to any crime on Frederick Augustus's part, and the fate of Saxony would prove to be one of the main issues at the Congress of Vienna. 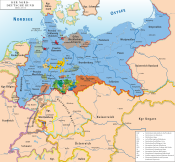 In the end, 40% of the Kingdom, including the historically significant Wittenberg, home of the Protestant Reformation, was annexed by Prussia, but Frederick Augustus was restored to the throne in the remainder of his kingdom, which still included the major cities of Dresden and Leipzig. The Kingdom also joined the German Confederation, the new organization of the German states to replace the fallen Holy Roman Empire. During the 1866 Austro-Prussian War, Saxony sided with Austria, and the Saxon army was generally seen as the only ally to bring substantial aid to the Austrian cause, having abandoned the defense of Saxony itself to join up with the Austrian army in Bohemia. This effectiveness probably allowed Saxony to escape the fate of other north German states allied with Austria — notably the Kingdom of Hanover — which were annexed by Prussia after the war. The Austrians and French insisted as a point of honour that Saxony must be spared, and the Prussians acquiesced. Saxony nevertheless joined the Prussian-led North German Confederation the next year. With Prussia's victory over France in the Franco-Prussian War of 1871, the members of the Confederation were organised by Otto von Bismarck into the German Empire, with WIlliam I as its emperor. John, as Saxony's incumbent king, was subordinate and owed allegiance to the Emperor, although he, like the other German princes, retained some of the prerogatives of a sovereign ruler, including the ability to enter into diplomatic relations with other states. Wilhelm I's grandson Kaiser Wilhelm II abdicated in 1918 as a result of Germany's defeat in World War I. King Frederick Augustus III of Saxony followed him into abdication and the erstwhile Kingdom of Saxony became the Free State of Saxony within the newly formed Weimar Republic. The king was named as head of the nation. He was required to follow the provisions of the constitution, and could not become the ruler of any other state (save by blood inheritance) without the consent of the Diet, or parliament. The crown was hereditary in the male line of the royal family through agnatic primogeniture, though provisions existed allowing a female line to inherit in the absence of qualified male heirs. Added provisions concerned the formation of a regency if the king was too young or otherwise unable to rule, as well as provisions concerning the crown prince's education. From 1697 the Electors of Saxony became Roman Catholic in order to accept the crowns of Poland and Lithuania, of which they were kings until 1763. The royal family remained Roman Catholic, ruling over a domain that was 95% Protestant. In the wake of the tumultuous 1848 revolutions, Saxony's Landtag extended voting rights (though still maintaining property requirements) and abolished voting-taxes. In 1871, Saxony was incorporated into the German Empire and more voting rights were gradually extended. By the early 1900s, Saxony's local politics had settled into a niche in which Social-Democrats, Conservatives, and National-Liberals were splitting the share of votes and Landtag seats three ways. (In 1909: Social-Democrats won 27% of seats, Conservatives won 31% of seats, "National-Liberals" won 31% of seats). Voter participation was high (82% in 1909). Wikisource has the text of the 1911 Encyclopædia Britannica article Saxony (kingdom). ^ Herbermann, Charles, ed. (1913). "Saxony" . Catholic Encyclopedia. New York: Robert Appleton Company. ^ Constitution of Saxony, Sections 5 and 138. ^ Constitution of Saxony, Sections 6-7. ^ Constitution of Saxony, Sections 9-15. ^ Constitution of Saxony, Section 43. ^ Constitution of Saxony, Section 52. ^ Constitution of Saxony, Section 57. ^ Constitution of Saxony, Section 67. ^ Constitution of Saxony, Sections 85 and 87. ^ Constitution of Saxony, Section 88. ^ Constitution of Saxony, Sections 94, 112 and 113. ^ a b Constitution of Saxony, Section 103. ^ Constitution of Saxony, Sections 115 and 116. ^ Constitution of Saxony, Section 41. ^ Constitution of Saxony, Section 134. ^ Constitution of Saxony, Sections 27-37. ^ Constitution of Saxony, Section 62. ^ Constitution of Saxony, Section 63. ^ Constitution of Saxony, Section 66. ^ Constitution of Saxony, Section 68. ^ Constitution of Saxony, Section 69. ^ Constitution of Saxony, Section 71. ^ Constitution of Saxony, Section 72. ^ Constitution of Saxony, Section 74. ^ Constitution of Saxony, Section 80. ^ Constitution of Saxony, Section 81. ^ Constitution of Saxony, Section 83. ^ Constitution of Saxony, Section 85. ^ Constitution of Saxony, Section 86. ^ a b Constitution of Saxony, Section 92. ^ Constitution of Saxony, Section 96. ^ Constitution of Saxony, Sections 142 to 150. ^ Constitution of Saxony, Sections 44 and 47. ^ Constitution of Saxony, Section 153.